Nia, the skincare enthusiast and content creator behind @letsgetglowin, shares her favorites in beauty and skincare, as well as those on her to-try (or buy) list. She works in PR and Communications and is constantly testing conscious and effective skincare brands, especially for women of color. Outside of work, she spends her time outside running (with sunscreen applied of course), volunteering in her community, enjoying a new craft beer with friends, and/or watching way too many YouTube makeup and skincare tutorials. Hi everyone! I’m Nia, aka the person behind @letsgetglowin on Instagram. I currently work in PR and communications. While I love my job, my desire to start blogging through Instagram partially began because of my desire to express myself creatively outside of work, plus I have always loved skincare so it seemed like a natural fit. In addition to expressing myself creatively outside of work, I started my beauty blog on Instagram to keep a “diary” of my skincare journey and the many products that I tested. I have oily (very oily in the summer) and acne-prone skin and my biggest skin concerns are treating my hormonal acne, hyper-pigmentation, and skin texture. Aside from chronicling my skincare journey, I wanted to provide a voice for deeper skin-toned women who sometimes have unique skincare issues and needs. Despite how it may seem on Instagram, I actually stick to a very consistent skincare routine. I’ve been using the same face wash (Murad Clarifying Cleanser) for over two years and absolutely love it! Every once in a while I’ll test something new, but always find myself going back to it…it’s just so well-formulated! Other staple skincare products in my routine are the Belif True Cream Aqua Bomb, Andalou Naturals Clementine + C Illuminating Toner, and The Ordinary Niacinamide 10% + Zinc 1% serum. All of these products help me deal with my oily and acne-prone skin. I have also found that glycolic acid treats my acne more effectively than other active ingredients, so I try and incorporate a product with that in it in my evening routine. I like to introduce what I consider to be “bonus” skincare items to my routine weekly based on how my skin feels, which is why I love sheet masks and other intense facial treatments so much! It gives you the opportunity to try something new without disturbing your base routine. 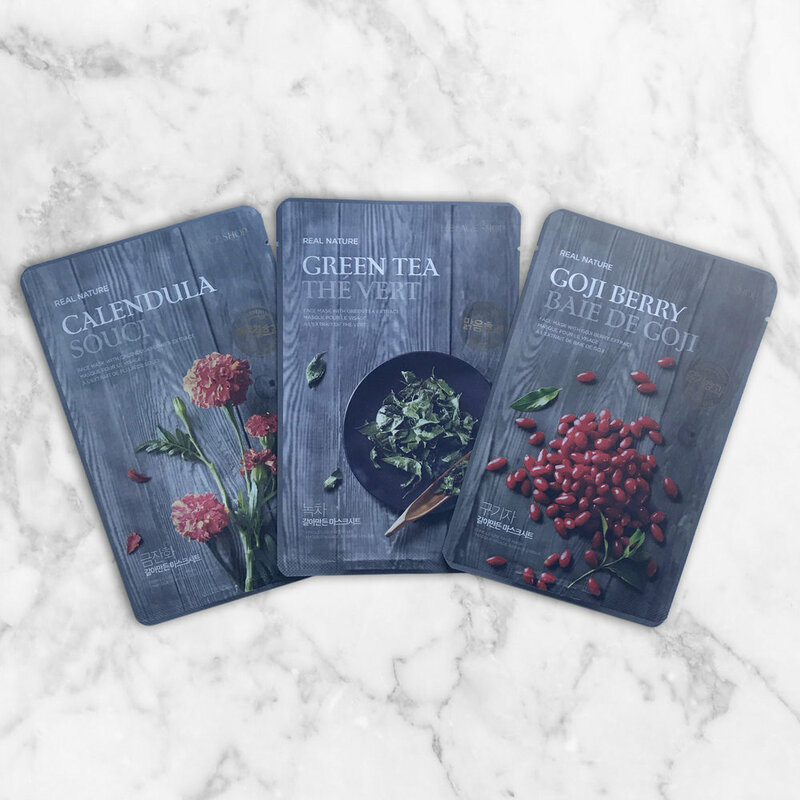 I spend a lot of time outside in the Spring and Summer, so I use moisturizing sheet masks that helps my skin feel healthy and plump. I’m currently using The Faceshop Real Nature sheet mask line. Also, since my skin is extra oily, I try and exfoliate twice a week. My favorite product for that is Pixi Beauty Peel and Polish (which has glycolic acid and lactic acid!). As I try and test new products, I've discovered some great brands along the way. I’ve recently fallen in love with Farmacy Beauty! Their product line is simple but there is something for everyone! I was first introduced to the brand at Sephora when I tried their Honey Potion Mask (which is absolutely amazing!) and ended up testing a few other items of theirs. I now exclusively use their Green Screen Sunscreen. It’s moisturizing but lightweight and it blends in with my deeper skin tone very easily. I am also trying to be more conscious about the ingredients that I am putting on my skin so I love that it uses naturally derived ingredients. I’ve also started a skincare love affair with Glossier (I know, I know…I’m late to the party)! Their Mega Green Galaxy Pack really took me by surprise. It is jam packed with amazing ingredients, is definitely detoxifying and feels so good on the skin! I try not to lust after too many products at once, but I do keep a skincare list to keep track of products that I think would be great for my skin. The deal I’ve made with myself is that I can only buy these products once I’ve used up one in my current routine. First on my list is Drunk Elephant C-Firma! I haven’t had very good luck with the Vitamin C serums that I have tested recently, but I know how important it is to have a good antioxidant in your skincare routine and I’ve heard so many good things about this one. It’s a bit pricey for me, but I hope to catch it on sale soon. I also have the Tata Harper Regenerating Cleanser on my list. I received a sample at Nordstrom and really loved how my skin felt after use! Honestly there are so many great options now currently on the skincare market that it’s difficult to think there’s a need for more products. I think it’s more about what finding works. In an age with YouTube skincare hacks, I don't believe using kitchen ingredients as skincare products always works. While I’m all for DIY products, I think it’s important to work with high quality ingredients that are specifically formulated for skincare. Depending on your skin type you may actually have a negative reaction from some of the kitchen ingredients you use. This is especially true for acidic substances, like pineapple, lemon, and apple cider vinegar. There are definitely some great natural DIY skincare options out there, just make sure you do your research (and patch test) before jumping in. A reliably good resource and beauty muse? I’m a huge fan of beauty YouTuber Liah Yoo. Liah covers a wide range of beauty and skincare brands and does a great job of breaking them down (she has an amazing video covering her review of the majority of Glossier’s products). She’s also very knowledgeable and spends a lot of time focusing on the formulation and effectiveness of a product, which is super helpful because it’s so easy to get blinded by the amazing packaging and marketing that so many skincare brands have these days. Be patient. Lasting results don’t happen overnight! Be flexible. What works for you may change based off of things like stress, hormones, and even the weather! Be willing to try something new based on what your skin needs because it may definitely change. Be in tune with your health. Healthy skin also comes from within. I’ve recently discovered that dairy has a negative impact on my skin, so I’m working on cleaning up my diet. And this should go without saying, but do what’s best for you! It’s great to learn from others but no one knows your skin like you do.